According to Louisiana Wildlife and Fisheries, Oysters are the most economically important species in the area where fresh and salt water mix off the coast of Louisiana. Not news to Louisiana residents who have known the value of oysters for decades. Dating back to the late 1800’s, Louisiana legislators began allowing citizens to develop private oyster beds on public land, to address this shellfish’s sustainability. Louisiana Blue Crabs, Louisiana brown and white shrimp, and some crawfish species are also harvested in Louisiana coastal waters. From our backyard to your plate, we will discuss why shellfish should be the star at your next dinner. Just like their name says, Blue Crabs are distinguished by the blue color of their body and legs shell. 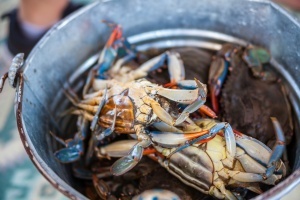 Louisiana Blue Crabs or soft-shell crabs as they are often referred to, have a sweet flavor profile. Louisiana is one of the primary producers of this crab. Fresh Louisiana Blue Crab is prime in summer months (May-September) but frozen options are available year round. According to a 2017 report released by Fish Choice, Blue Crab Sustainability in 2016, 1/3 of U.S. landings are MSC-certified with 100% of that being Louisiana landings. The MSC, an acronym for the Marine Stewardship Council, is a non-profit organization with an eco-label that denotes certified sustainable fishing practices. Since recent reports reflect how sustainable the Louisiana Blue Crab is, this shellfish is great to boil, fry, grill, steam or sauté. 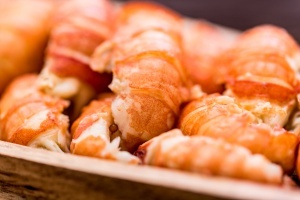 Another popular shellfish alongside crab is shrimp. Check out our restaurant partner, Seither’s Seafood for some crab inspiration. Adding simple seasonings like garlic add a great balance to the natural sweetness of shrimp. Louisiana shrimp is categorized under brown and white. Brown shrimp are caught from May to August but like their shellfish neighbors, are available frozen year round. They have a stronger flavor than their white counterparts and are slightly smaller. White shrimp are known for being large and mild in flavor. Louisiana is the third largest producer in the U.S. of brown shrimp and the number one producer in the U.S. of white shrimp. In August of 2018, it was reported that one of two fishery improvement projects for white shrimp (combined with other shrimp) was launched in Louisiana. 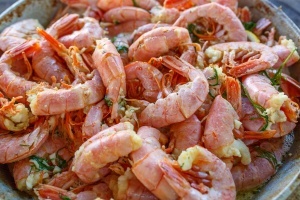 1 The focus to make shrimp one of the best options for sustainable seafood is marked by its popularity, and uses in famous Louisiana dishes such as shrimp etouffee, shrimp creole, jambalaya, gumbo and po’ boys. Another popular Louisiana favorite is crawfish. Check out our restaurant partner, The Gumbo Shop for some shrimp inspiration. Crawfish tails are commonly boiled but can be fried, grilled or sauted. Most Louisiana Crawfish are harvested December through June with the peak times being March, April, and May. The Louisiana Crawfish Promotion and Research Board (LCPRB) was created to further develop the Louisiana crawfish market and research ways to further the industry. In this mission, more than 120 million pounds of crawfish is supplied from Louisiana. Although these freshwater crustaceans are abundant in marshes and swamps, there are thousands of acres of crawfish ponds managed by farmers that contribute to this supply. Farmed crawfish is a big part of not only the sustainability of this large industry but the over 300 million dollars of annual revenue it brings to Louisiana. From popular crawfish boils to crawfish etouffee, this easy-to-prepare, low calorie, high protein, can make your next meal full of flavor. Check out our restaurant partner, Kenner Seafood for some crawfish inspiration. Intimidating as they may seem, shellfish can be an easy-to-prepare, sustainable option for your next dish. Piazza Seafood sells several different varieties of crab, shrimp, and crawfish to meet any home cook’s needs. Get some inspiration and don’t be afraid to make your own creation. Want to know more? 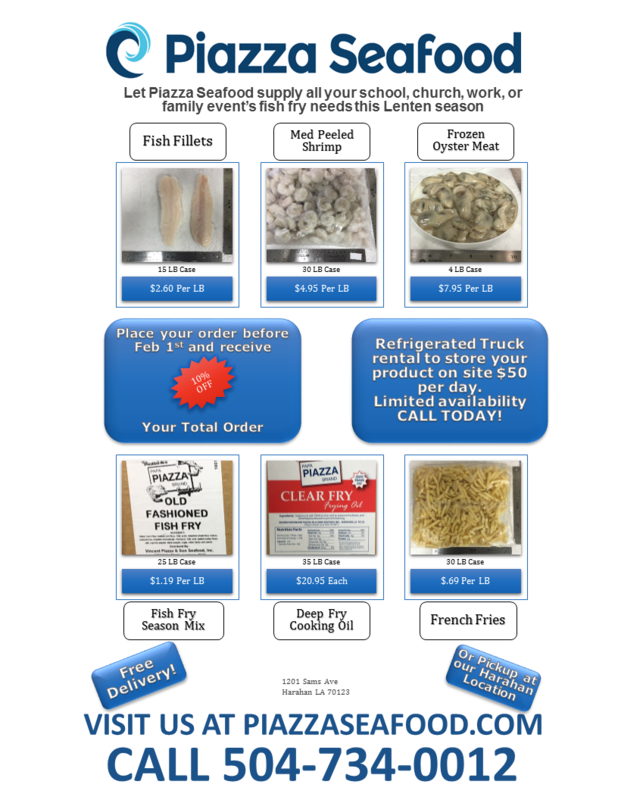 Visit us at PiazzaSeafood.com to find out how you can get seafood delivered to you and stay tuned for our next restaurant feature. Fish Choice, Shellfish Profiles, https://fishchoice.com/content/shellfish (accessed November 8, 2018).